We have a 300 gallon tank complete setup that we would like to sell. My boyfriend and I bought it last year, but have not had the money or time to get it set up to it’s full potential, and now we are thinking of moving so we are wanting to sell the tank to someone who will be able to enjoy it. 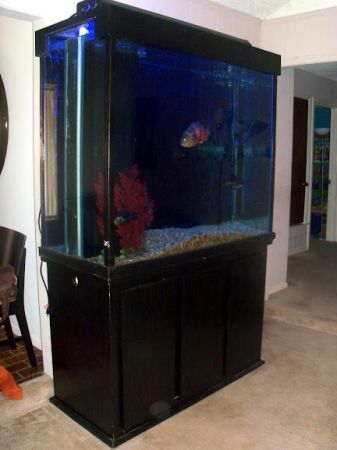 It’s a really awesome tank, and would be great for someone with cichlids or other large fish. The tank is a custom built DAS in wall room divider style, but it works great as a freestanding aquarium. The stand is black wood with 3 functional doors and it is 35″ tall. The tank is 48″ tall x 23.5″ wide x 53″ long. We have a 50 gallon sump in the cabinet underneath, large return pump for sump, glass lids, a 4 foot Trinity 4 bulb day/night light with LEDs, 2 Eheim Jager heaters, a Tetra deep water air pump, natural river rock large gravel, and 3 huge plants that were purchased for this tank. We are asking $1500 OBO for the complete setup, but would be willing to sell just the tank and stand for $700 if you are not interested in the accessories.